Six months after David Foster Wallace’s suicide, The New Yorker published a novella-length piece by journalist D.T. Max on Wallace’s last difficult years and his encompassing effort to surpass Infinite Jest. That article started the drumbeat for two books: The first, The Pale King, was released last April and pored over by critics and readers; the second, Max’s biography, Every Love Story is a Ghost Story: The Life of David Foster Wallace, arrives next week. The biography was written with the cooperation of Wallace’s family and is the first definitive treatment of the author’s life. Every story has a beginning and this is David Wallace’s. He was born in Ithaca, New York, on February 21, 1962. His father, James, was a graduate student in philosophy at Cornell, from a family of professionals. David’s mother, Sally Foster, came from a more rural background, with family in Maine and New Brunswick, her father a potato farmer. Her grandfather was a Baptist minister who taught her to read with the Bible. She had gotten a scholarship to a boarding school and from there gone to Mount Holyoke College to study English. She became the student body president and the first member of her family to get a bachelor’s degree. Jim and Sally had their daughter, Amy, two years after David, by which time the family had moved to Champaign-Urbana, twin cities in central Illinois and the home of the state’s most important public university. The family had not wanted to leave Cornell—Sally and Jim loved the rolling landscape of the region—but Wallace had been offered a job in the philosophy department in the university and felt he could not turn it down. The couple were amazed when they arrived to see how bleak their new city was, how flat and bare. But soon, happily, Jim’s appointment turned into a tenure-track post, Sally went back to school to get her master’s in English literature, and the family settled in, eventually, in 1969, buying a small yellow two-story house on a one-block-long street in Urbana, near the university. Just a few blocks beyond were fields of corn and soybeans, prairie farmland extending as far as the eye could see, endless horizons. Here, Wallace and his sister grew up alongside others like themselves, in houses where learning was highly valued. But midwestern virtues of normality, kindness, and community also dominated. Showing off was discouraged, friendliness important. The Wallace house was modest in size and looked out at other modest-sized houses. You were always near your neighbors and kids in the neighborhood lived much of their lives, a friend remembers, on their bikes, in packs. Every other kid in that era, it seemed, was named David. There was elementary school at Yankee Ridge and then homework. The Wallaces ate at 5:45 p.m. Afterward, Jim Wallace would read stories to Amy and David. And then every night the children would get fifteen minutes each in their beds to talk to Sally about anything that was on their minds. Lights-out was at 8:30 p.m., later as the years went on. After the children were asleep, the Wallace parents would talk, catch up with each other, watch the 10 p.m. evening news, and Jim would turn the lights out at 10:30 exactly. He came home every week from the library with an armful of books. Sally especially loved novels, from John Irving to college classics she’d reread. In David’s eyes, the household was a perfect, smoothly running machine; he would later tell interviewers of his memory of his parents lying in bed, holding hands, reading Ulysses to each other. For David, his mother was the center of the universe. She cooked his favorites, roast beef and macaroni and cheese, and baked his chocolate birthday cake and drove the children where they needed to go in her VW Bug. Later, after an accident, she replaced it with a Gremlin. She made beef bourguignonne on David’s birthday and sewed labels into his clothes (some of which Wallace would still wear in college). Garth has an essay on Amazon’s celebrity reviewers up at Slate.Full disclosure: It was late at night, in a fit of furtive self-Googling, that I discovered the first Amazon customer review of my debut book of fiction. “Superb,” wrote Grady Harp of Los Angeles. “Fascinating … addictive.” Not to mention “profound.” Such extravagance should have aroused suspicion, but I was too busy basking in the glow of a five-star rave to worry about the finer points of Harp’s style.Check it out. Joel Stein of the LA Times is bravely calling the wrath of legions of Harry Potter fans down upon himself, but I can’t say that I agree with what he’s trying to say. First there’s the headline: “Hogwarts fans, you’re stupid, stupid, stupid.” Not mincing any words there. Stein is apparently infuriated that so many adults are excited about the upcoming Harry Potter book. “Next Saturday, when the sixth Harry Potter book comes out, at the very least I want you to stammer excuses when I see Harry Potter and the Half-Blood Prince on your nightstand. I want you to claim you’re reading it to make sure it’s OK for your kids, or your future kids, or even, if you have to, for kids in general,” he writes. He goes on to bash adults who enjoy C.S. Lewis, E.B. White and J.R.R. Tolkien (“Isn’t it a clue that you should be ashamed of reading these books past puberty when the adults who write them are hiding their first names?”) and Finding Nemo. Stein’s grating tone aside, there are two points I’d like to make: First, some of the best books and movies we have were written for kids (or kids AND adults). It must be sad to go through life avoiding “kid stuff” because you don’t deem it to be intellectually up to par. Secondly, what do you think all these adults who are reading Harry Potter will read instead? It will be Dan Brown and James Patterson on their nightstands, if they read at all. Is that really so much better? I say that if people are reading it’s a good thing for the book industry and for our culture – even if it is just a kids’ book. What Is It About Hibbing? Bob Dylan was born in Duluth but spent his formative years in Hibbing, a small, isolated northern Minnesota town whose claim to fame (according to the billboard that greets you as you come into town) is that it’s home to the world’s largest open-pit iron mine. It’s also my hometown, in an area so remote from Minneapolis that a friend from the city had never heard of it. There are a number of towns in Minnesota’s Iron Range, which covers the upper fork of the state, but Hibbing is a particularly weird place given an accident of history; its inadvertent placement atop one of the richest veins of iron ore meant the mining company had to grant the townspeople major concessions to persuade them to move its location. 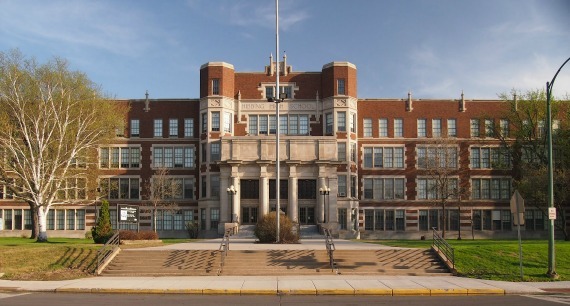 Thus Hibbing is the only town with a high school listed in the National Register of Historic Places: the building cost four-million dollars (in 1923! ), complete with marble floors in the bathrooms, a 1800-seat auditorium patterned after the Capitol Theatre in New York City, and a Broadway-level green room. Because Hibbing, which is near Canada, wasn’t the most hospitable place to live (in his memoir, Chronicles, Dylan described the winters as so cold and unending as to be hallucinogenic), the mining company also invested in education: the superintendent of the school system supposedly received the highest salary of any school district in the state, and K-12 instructors were paid unusually high salaries for the area. The Hibbing public schools were thus funded more like lavish private schools, so you end up with people like English teacher B.J. Rolfzen, who is often credited by Bob Dylan for instilling in him a love of language. To give you an idea, this is where we had our pep rallies for homecoming, our auditorium. You can imagine yourself laughing a young Bob Dylan (then, Robert Zimmerman) off the stage at the talent show (yes, this happened). The uncle of one of the kids I sat next to in Earth Sciences in junior high was Vincent Bugliosi, the Charlie Manson case prosecutor and the author of the best-seller about the case, Helter Skelter. Bethany McLean has the distinction of being the person who broke the Enron scandal; she wrote about first in Fortune magazine, and then in the best-selling Enron: The Smartest Guys in the Room, which was made into a movie of the same name. Rick Novak, M.D., is the author of a medical thriller set in Hibbing that references the newest Nobel Laureate: The Doctor and Mr. Dylan. Frank Riley, author of various science fiction novels, won a Hugo Award for They’d Rather Be Right, which he co-wrote with Mark Clifton — apparently this was only the second time the Hugo was awarded to a novel. Who will come out of Hibbing next? It seems that all of the DFW attention is on the person and life…and death…rather than on the works. I wonder if a certain segment of serious readers see him as both their ideal self- philosophy major, big thinker/writer-and their worst fears…and fascination with…his depression and death. I’d be curious to know the demographics–strikes me as male dominated (yes, with some women), and of a certain age? @Grant: I was worried as well – the focus on the mental illness/addiction/suicide drama in favor of the literary genius and craftsman. @Grant and @elle – I tend to categorize Wallace as my favorite modern author, and it seems to me–from what I’ve read on him thus far–the amount that his illness/addiction/etc. drama played into his work was by no measure minuscule. His personal life during any given period of his fiction/nonfiction (this works for most authors, I suppose) was monumental to the very thing he chose to write about. When he was going through rehab and became deeply infatuated with Mary Karr (who was also going through rehab), from those experiences, he churned out “Infinite Jest”–there is a clear correlation in how much of the book focused around a halfway house and its recovering populous. I guess what I’m trying to say here is that it’s impossible to separate the two from each other–the addiction/depression and his literary genius/craft. Circularly, one formed the other and so on. I am certainly no DFW apologist, but I remember him being showered with attention prior to his suicide. For better or worse, people will be writing PhD theses focusing on his work for many years to come which I imagine will mention these personal issues only in passing if at all. Wallace is ridiculously overexposed. You’d think scholars and biographers would find some other writers to reappraise and discover new facets to. An interesting note, DFW never discussed addiction, depression, or his personal experience in a halfway house in any interviews. Yet those subjects are rife in his work. Oh but he does in of course you end up becoming yourself. Maybe not so at length as the people writing about him, but considering it’s a 300 page interview style book, it does come up. inevitably. Also, he has a cool name, a cool face, a cool way of talking, is self-effacing, mischievous in his prose, and powerful. He is what happens when the flawed and broken genX has a brain the size of a HumVee. I don’t see anything wrong with seeing DFW as our best and worst selves. I think that was the whole point. It doesn’t cheapen the fact that we are fixated on him. I think it simply speaks to the writing itself, its power to make us feel less alone, and more alone, at the same time. This polarity is a game of chicken. Dive into the stark center of DFW’s psyche and you could feel completely un-alone (connection), or completely alone (solipsism). I’ve read everything, fiction and non, and pale king, too. I believe his best readers are attracted and repelled. can’t wait for this book. DT Max’s article (in Spin I think it was?) – one of the best. I think this book is a bad idea, and I plan on cracking open my copy as soon as I get it manana. RAL writes: “I think it simply speaks to the writing itself, its power to make us feel less alone, and more alone, at the same time. This polarity is a game of chicken. Dive into the stark center of DFW’s psyche and you could feel completely un-alone (connection), or completely alone (solipsism). I’ve read everything, fiction and non, and pale king, too.” I would really like to find writers about the life of DFW who also can make these sorts of explicit connections to his works–quoting examples, teasing out illustrations of your points here. That’s the disconnect I find in the adulation. Not saying it’s not real or possible; just haven’t come across it. I am so looking forward to this biography. The intersection between DFW’s personal biography and his professional writing biography is so touching and intense. The genius of great artists is so bound up with their psyches. I love that these opening paragraphs show the Midwestern pastoral he grew up in, and hope that Max goes deep into that womb with stories and examples of how amazing life in a Midwestern college town was — and life in those strange heady days. Wallace’s later demons and his dance with linguistic virtuosity was so wild and seemingly out of control. And then there is the battle with bipolar reality…So many of us have a touch of that disease. It is so modern and so American. And so painful and self-defeating. And Wallace was one of the best and most honest writers to document (and talk about) what it could do to a gentle, well-meaning soul. I agree with Andrew in that separating his life from his work, especially in a biography, would be a mistake. Imagine a biography of Dostoevsky that ignored his prison sentence and conversion to his peculiar brand of Russian Orthodox Christianity in favor of his works. It would hardly be a biography; it would be a literary study. Fortunately, we have room for both. Agreed. It would be a great idea and I’m sure it’s doable. Safe bet that his canon will be picked apart, like you describe, over the next century. He’s immortal. Might as well talk about Him versus his work for a while, while he’s still fresh in our minds. Our grandchildren won’t have that luxury.